People from various communities and leaders of various local organisations welcomed Shah, who was accompanied by party leaders like Deputy Chief Minister Nitin Patel and other party office bearers from Gandhinagar and Ahmedabad. BJP national president Amit Shah on Sunday held a roadshow in Kalol town area while also holding group meetings with party workers in various parts of Ahmedabad that fall under Gandhinagar Lok Sabha constituency from where he is fighting the LS elections for the first time. 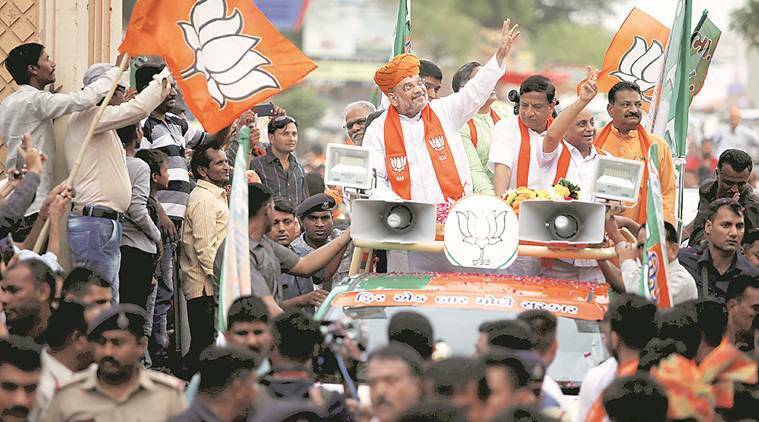 The Kalol roadshow was Shah’s third roadshow in the run up to his Lok Sabha election contest. Shah launched his roadshow from Kalol town while garlanding a statue of Dr B R Ambedkar on the latter’s birth anniversary. The seven-km long roadshow then passed through various areas like Three Fingers Circle, Khooni Bungalow, Railway Station, Khamar Bhuvan, Tower Chowk, Jyotishwar Mahadev, Old Fire Station Gate, Nandlal chowk, Vakharia crossroads, Cobra Circle, Sharda Circle, Borisana Culvert and Ambikanagar before concluding at Panchvati Hanuman temple. Kalol is one of seven Assembly constituencies that form Gandhinagar Lok Sabha constituency. The other six constituencies include Vejalpur, Naranpura, Ghatlodia, Sabarmati, Sanand and Gandhinagar (North). Kalol currently has a Congress MLA, Baldevji Thakor. Congress MLA from Gandhinagar (North) assembly seat, C J Chavda, is contesting against Shah as Congress candidate. Rest of the five assembly constituencies are being represented by BJP. Before the roadshow, Shah conducted a series of meetings with the party’s top office bearers in various wards of Ahmedabad such as Ranip, Sabarmati, D-Cabin, Chandlodiya, Ghatlodiya, Gota, Naranpura, Nava Vadaj and Stadium. Before this, Shah led a roadshow from Naranpura to Ghatlodia area of Ahmedabad before filing his nomination papers on March 30. Later, on April 6, Shah held a two-part roadshow in Ahmedabad city on April 6.